Slingbox PRO-HD review | What Hi-Fi? 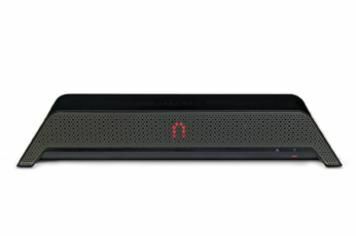 The Slingbox PRO-HD connects to your video devices at home and pumps the content out via Ethernet, allowing it to be viewed from any computer, whether it's in your bedroom or a coffee shop in Sydney. There's even now an application that allows you to access your content on a smartphone. All good, but there are some drawbacks. It's disappointing that although this is called the PRO-HD, the onboard Freeview tuner is standard-def. What's more, the maximum resolution it can handle is 1080i rather than 1080p. And you can only connect a single HD source (as well as two SD ones). But what's really disappointing is that the only HD input is component. That's a big concern when you consider that devices such as Apple TV and Sky+ HD 1TB don't have it, and that many sources with both HDMI and component can only use one at a time, which means you'd have to downgrade from HDMI at home to incorporate the Slingbox. Of course, if you do have a source that outputs through both simultaneously, like a standard Sky+ HD box, the Slingbox can be very useful. There's nothing quite like being able to control and access saved telly to improve a dull business trip, and the video quality, though dependant on the monitor you're using, is generally crisp and controlled. Unfortunately, the lack of HDMI limits its usefulness, and that's only going to get worse. That makes £250 seem pricey, especially when you have to pay £18 for the iPhone app.